I teamed up with two UX designers to develop a new digital product for an existing brand. We decided to develop a product for travel planning, since travel is something we are all passionate about. We all agreed that organizing a large group trip involves a lot of planning and decision making. The group needs to stay in constant communication to coordinate flights, accommodations, and expenses. They also need to make decisions on dining options and activities. How might we help streamline the coordination, communication, and planning of group trips for trip goers? We started by conducting interviews to validate the need as well as discover pain points associated with planning group travel. We found target users by sending out a screener survey and interviewed them about their travel planning experiences. We consolidated our findings and found that there is a need for a group travel coordination app. We found that the main pain points associated with group travel planning include communication, expense tracking, transportation coordination, and activity planning. We also learned that many people are currently using Google Sheets and Google Docs for group travel planning. Next we assessed the market for group travel and identified competitors. According to an AirBnB survey of 2000 online participants, 79% of US travellers said they’ve been on multiple group trips in the last five years. However, there are few apps that serve this market. We built a competitive matrix and identified competitors as apps focused on group travel planning. We learned that Tripper Keeper’s 3 main competitors are Prava, Travefy. And Grup Trip. Next, conducted a feature analysis to determine if any of the competitor products were meeting all of the user needs. We found that found that non of the apps offered a complete solution for coordinating group travel. We analyzed the research findings and found 4 major recurring themes. Then, we tied each theme to a proposed design feature. Users need frequent communication when coordinating a group trip. Users need group feedback to make decisions on plans. Users are frustrated manually tracking expenses. Users like to coordinate flight and hotel plans. We also developed two personas to help us empathize with our user as we designed an experience for them. We built these personas using the synthesized findings from our research. We decided that Tripper Keeper would integrate best with Google's travel app, Google Trips. 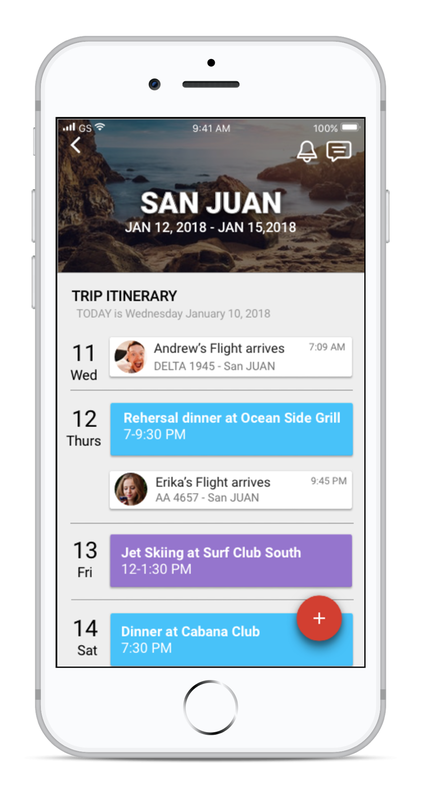 Google Trips is an app that allows individuals to plan upcoming trips. We consider them to be an indirect competitor because while they offer traveling planning, it does not offer collaboration. Our app would benefit Google Trips by offering group planning, centralized communication, and shared itineraries. To validate our designs, we conducted 2 rounds of usability testing with 8 users. Our first round of usability testing had an 88% success rate. This is because users did not find the location of the activity feed was not intuitive. We moved the activity feed to the home screen in an alert icon. The users were also unsure which tile contained the summarized group plans. We surveyed the users and found that the name “Group Itinerary” was most intuitive to them. Our second round of usability testing had a 97% success rate. This was a significant improvement from our first, indictating our design modifications were successful.